Strong roots hold the teeth firmly in place, anchored into the jawbone. Molars and premolars usually have several roots, whereas front incisors are single-rooted. The tip of each root is termed the apex, and is where the nerves and blood vessels enter the tooth, and delivers the blood to the crown, or visible top, of the mouth. 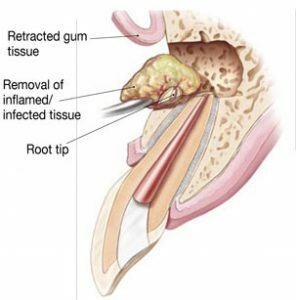 A root canal refers to the cleaning of the canals and the removal of infected tissue within the root. When the inflammation persists after the root canal treatment, an apicoectomy may be required. Essentially, an apicoectomy is the removal of the apex, or root tip, and the subsequent filling procedure to seal the root from further infection. When left untreated, infected roots can spread infection, cause decay and damage surrounding teeth. -narrow or curved root canals: when the root canal is poorly shaped, files cannot reach the root tip. Continuing infection or reinfection can then occur. Prior to the surgery, Dr. Khan will generally prescribe an antibiotic or anti-inflammatory medication to treat the underlying infection. Dr. Khan and his team will take x-rays and conduct an oral examination to plan and proceed with a treatment plan.